The permanent care and feeding is necessary for healthy hair. The hair dryer, styling, coloring, long-term impact of the sun leads to exhaustion and moisture loss. Hair loses shine and vital strength. Is it possible to resist? The problem solution is found! The device is developed with triple effect ofmedical and regenerative procedures. It isSalon-Royal-Hair Ultrasonic Treatment Styler - Ultrasonic Styler with infra-red elements for hair treatment. No styling products are necessary, no overheatis possible! Would you like to know how does IT work? 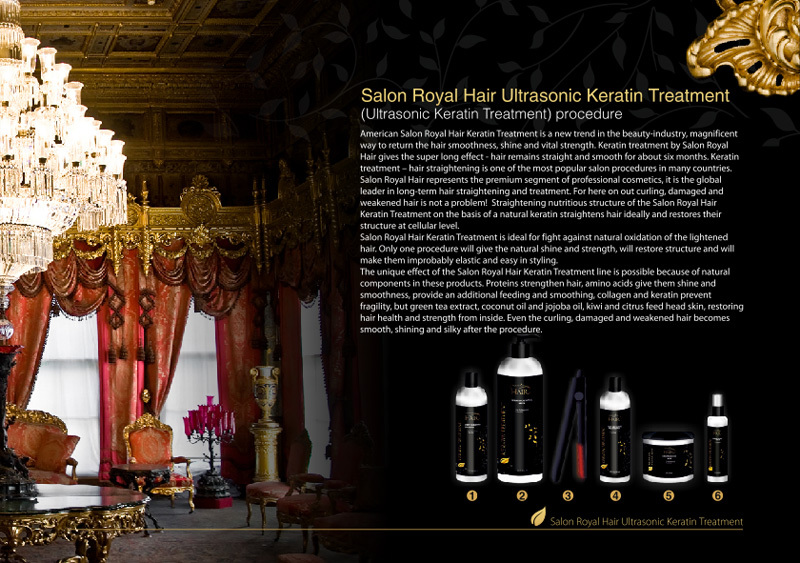 The innovative Ultrasonic Treatment Stylertechnology is based on ultrasound and infra-red radiation synthesis. The ultrasound creates high-frequency vibrations. They turn water, proteins and other nutrients into microscopic gaseous particles which easily get into structure of hair at normal temperature. IRbeams provide penetration of keratin and amino acids into hair structure, restoring hairelasticity and ideally smooth a cuticle.Ultrasonic Treatment Styler units infra-red beams and ultrasound: temperature increasejust for few degrees and vibration increase speed of regenerative processes considerably.It means that you will receive instant RESULTwith Salon-Royal-Hair Ultrasonic Treatment Styler: healthy and strong shinyhair without styling products and overheat. restructuring of hair fibers, hair tip restoring. If you need to increase effectiveness of any salon procedures, it is necessary to clean hair completely and raise their susceptibility to active components of professional cosmetics. It is necessary to work delicately because damage of the hair structure is possible. Salon Royal Hair Keratin Cocktail Leave-In is an absolute hit, ideal tool of hair treatment and easy styling after washing! Features of the indelible balm and thermoprotection against external factors are kept and it effectively straightens unruly hair and gives them surprising shine as well. The mask “Keratin Cocktail” developed by Salon Royal Hair is a supereffective hair restorer. It is designed for restoration of internal structure of badly damaged or dyed hair. Mask components get into the cuticle and restore hair from inside. Finding micro-cracks and emptiness in the hair structure and filling them, they create protection against loss of moisture, destruction and keratin washing away, ideally humidify hair and restore their unique brilliancy.